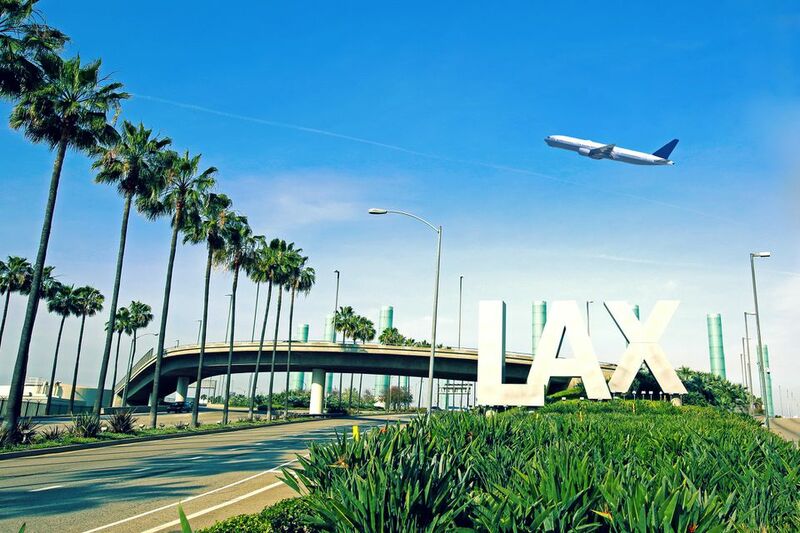 Los Angeles International Airport, commonly and officially known as LAX, is the world’s fifth busiest passenger airport. Its terminals accommodate 60 million passengers per year on 90 airlines. The seven/eight two-story terminals are arranged in a U shape, with car traffic on both levels and the iconic space age-themed building at the center. You're welcomed to the airport on the ground by giant pylons that light up in a rainbow of colors at night. Arrivals are on the lower level and Departures on the upper level. All gates are accessible directly from the terminals without additional shuttles. Some walking distances are significant between gates and street access. Driving into the airport, the terminals and their airlines are well marked, but you won't see any signs for Terminal 8, which is a wing of United Airlines that can only be accessed through Terminal 7. Since LAX is a loop layout, there is no central concourse with a hub of amenities. Each terminal has separate security screening and its own dining and shopping options, and all terminals are not created equal. If you have a boarding pass leaving the same day, you can go to any terminal, either walking to adjacent terminals or taking the Airport Shuttle Bus A. Certain terminals are connected to each other within the secured area, so you can go back and forth more easily, but for other terminals, you have to leave and go through security again to enter another terminal and again to return to your original terminal. Terminals 6 to 8 are connected within the same security area. LAX is currently in the middle of a transformation, and the construction has created traffic challenges and a dearth of amenities in terminals being remodeled. Two terminals have now been completed. First is the Tom Bradley International Terminal (TBIT), which rivals top malls for shopping and dining options with stunning public art. Unfortunately, it's not connected inside to any other terminal, so to visit from another terminal, you'll have to go through security again. The second terminal to be completed is Terminal 2, which now has half a dozen new restaurants and a small but nice selection of shops. It's one of the smaller terminals, so the offerings don't compare to TBIT. During the renovations, Terminals 2 and 3 have very few amenities open, so if you're flying out of those terminals, you might want to eat before you get to the airport or pack a lunch for the plane if you want something besides a burger or coffee. The 90 airlines flying into Los Angeles International Airport include domestic and international flights. International flights all have to clear customs. Although the Tom Bradley International Terminal at the west end of the airport receives the most international traffic, international flights use other terminals as well. There are separate Customs facilities in each terminal which receives international flights. ICE currency exchange booths are located in the arrivals hall at the Tom Bradley International Terminal and on the upper-level departure/arrival halls at all the other terminals. Fax and photocopying are also available at the ICE booths. Most terminals have two Bank of America ATMs (cash machines) in the gate areas, but terminals 2, 7, and 8 have only one each. There are also ATMs in the arrivals areas. If someone is meeting you at the airport, they will have to meet you curbside or at baggage claim on the lower level. Professional drivers and tour operators meeting passengers usually meet you near the baggage claim area with signs. In the Baggage Claim area of each terminal, you'll also find the rental car counters, an Interactive Visitor Information Board where you can call for hotel reservations if you need them, and possibly Visitor Information Volunteers. There are restrooms in the Baggage Claim areas, but they're usually not as nice or as large as the ones near the gates. The options for getting to your final LA area destination from LAX are many and diverse, from rental cars and taxis to shared ride vans, limousines, rideshare apps, FlyAway shuttles, and public transportation. The Ground Transportation options for those departing from LAX are the same as for those arriving at LAX. Note: During construction, traffic getting into the airport is extra slow, so plan extra time. If you're flying out of LAX, you can park in the central parking structures, but it will cost you per day. Each central structure is numbered to match its nearest terminal. Remote Economy Parking Lot C is slightly cheaper with a free shuttle to the terminals. There are also dozens of private parking lots with free shuttles to LAX, including stand-alone parking facilities and some nearby hotels that offer long-term parking. To find the best parking deal and reserve your spot in advance, check out AirportParking.com. Allow extra time to wait for the shuttle transfer when parking off-site. Each airline has their own guidelines for how early you have to get to the airport before a flight, ranging from 1 to 2 hours for a domestic flight to 2 to 3 hours for an international flight. You can usually check in online and print your boarding pass or send it to your smartphone. There are also self-serve boarding pass printers at most airlines if you checked in online, but didn't have access to a printer. If you're checking bags, curbside baggage handling and check-in is available for many airlines for a nominal fee, or inside, you can choose from the baggage-check-only lines if you have already checked in, separate check-in lines for those who didn't check in online, or if you're traveling First Class or have premium frequent flyer status, you'll have your own check-in desk. If you're not sure which line to get in, there's usually an airline staff person nearby who can direct you. Better to ask than waste time in the wrong line. To find out which terminal your airline uses, check online for an alphabetical list of airlines in each terminal. Check the terminal map for your terminal to see what amenities are available. Some terminals currently have very few amenities because they're under construction. If you're taking a long flight from one of those terminals, you might want to bring your own food, or arrive extra early and head to a different terminal for refreshments before you go through security. If you're a frequent flyer who has registered in advance for TSA pre-check, head to the short line. Plan ahead and follow TSA guidelines for what you can't carry in your carry-on bags — no guns or sharp objects, obviously, and many sporting goods are also banned. Follow the 3-1-1 Rule for liquids — no liquids, aerosols, gels, creams, and pastes over 3 ounces, with all fitting in one single 1-quart clear ziplock bag that gets placed separately in a screening bin. (Liquids purchased in the secure area can be carried on the plane.) Avoid carrying certain foods that are not permitted. Avoid wearing metal jewelry or clothing with metal embellishments going through security. Be prepared to take off your shoes, step through X-ray scanners, and be patted down. Since you can't bring liquid in with you, most terminals have water vending machines that sell bottled water for half the price of the same water at the newsstands. There are also miscellaneous vending machines selling merchandise, usually technology. If you have a flight transfer at LAX on the same airline, in most cases it will be in the same concourse. United is the exception, with two concourses. The 70s gates are in Terminal 7 and the 80s gates are Terminal 8, although Terminal 8 does not have a separate airport entrance. If you are transferring between airlines, there is a good chance that you'll have to change terminals. If the terminals are adjacent, you can walk from one to the next, although you'll have to go outside and go back through security. If you're transferring more than one terminal away, you will probably want to take the Airline Connections A Bus airport shuttle that stops on the Lower/Arrival Level islands in front of each terminal under the blue sign. Other shuttles stop in the same spot, so be sure to look for the white and blue LAX Shuttle with 'A' in the marquee under the blue LAX Shuttle & Airline Connections sign. The A Bus runs every 10-15 minutes, 24 hours a day. If the airline has scheduled the connection, enough time for the transfer should be built in, and you should be able to check your bags through. If you are scheduling your own flights between two airlines, allow at least 3 hours if you have to collect your bags and re-check them at another airline. If you're arriving on an international flight and making a transfer to a domestic flight — even on the same airline, you will have to go through customs. You should be able to turn your bags back over to the airline just beyond customs for continuing itineraries booked as one flight. If the flights were booked separately, you'll have to take the bags with you and check in again for your next flight. With 2 or 3 hours between flights, there's plenty to keep you occupied at the airport from shopping and dining to spa services. With 4 or more hours, you can leave the airport and hit the beach. If you're picking up someone who is arriving at LAX, you can park and meet them in the baggage claim area of their arrival terminal, or you can pick them up at the curb in the passenger loading area. There is absolutely no waiting at the curb. If you're picking someone up at LAX and arrive early, you could choose to continue circling until your passenger arrives, but the airport has a Cell Phone Waiting Lot at the northwest corner of 96th St./Vicksburg Ave., where motorists can wait for free until they get a call from their arriving passenger to come get them. Don't start heading into the airport until your passenger is at least at baggage claim since it's usually at least 20 minutes from touchdown to getting your bags. Vehicles must be attended at all times. Parking structures are located at the center of the U across from each terminal, with airport return access cutting across between parking structures. The parking lots in the center of the airport cost per hour. Be aware that it can take 10-15 minutes to find a parking space in the structures at times, so plan parking time in your arrival plans. There are also metered lots in the center of the loop. Structures can be entered from either the Arrival or Departure level. Metered lots can only be accessed from the lower Arrivals level. Individual airline policies may vary, but if you are meeting a passenger who is under 18 years old, you may go to the gate to pick them up only if the person who put them on the flight gave your name as the person picking them up. So be sure the person delivering the child or teen to the airport knows to give your name at check in as the person picking up the minor. Go to the Other Services line at the airline counter to get a guest pass to enter the gate area. If you are dropping someone off at LAX, you have the same choice of dropping them at the curb or parking and accompanying them to check in, but you'll have to say goodbye at the security line. For unaccompanied minors, you can request a guest pass to go with them to the gate. Be sure to have them make a note in the file at check-in who will be picking the minor up on the other end so that the person at the other end will be able to get gate access.